A group of Marine reservists are leading a three-day, 81 mile hike in Florida this weekend to honor those who died in the Battle of Fallujah in 2004. A group of Marines, leading an 81-mile hike in Florida to honor those who died fighting in Fallujah, Iraq in 2004, stand with their governor. From left to right: Cpl. Larry Rubino, Staff Sgt. Denis Vanegas, Florida Gov. 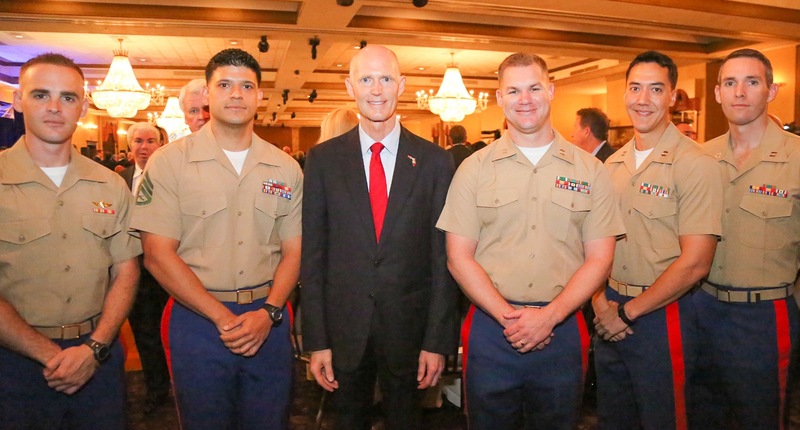 Rick Scott, Capt. Jason Wetherington, Capt. Chris Troken and Maj. Charleston Malkemus. Maj. Charleston Malkemus, an infantry officer who fought in the infamous Battle of Fallujah in Iraq in 2004, carries a flag he received from a Marine who was killed in action. He said he now displays it in his company office to remind other Marines of their commitment to uphold the expectations of their brothers-in-arms. And this weekend, he will carry the flag 81 miles as he helps lead a hike from West Palm Beach to Miami. Hiking with Malkemus will be four other Marines. They met during a tour of duty at Marine Corps Forces South in Miami, he said. Now they work together at Malkemus’ Miami tech start-up called Gozump. Malkemus said having experienced the fight in Fallujah made him want to honor those who didn’t make it back. What started as small team effort to make the hike that amounts to more than three marathons has gotten others interested. Now he said he estimates that about 50 people will spend Labor Day weekend hiking in 95 degree heat to honor those who lost their lives in battle. Those interested in joining can check the hikers’ location and status on social media. They’ll be updating their Facebook page and Tweeting along the way. And they invite members of the communities they pass through to walk with them — even if they don’t complete the whole hump.